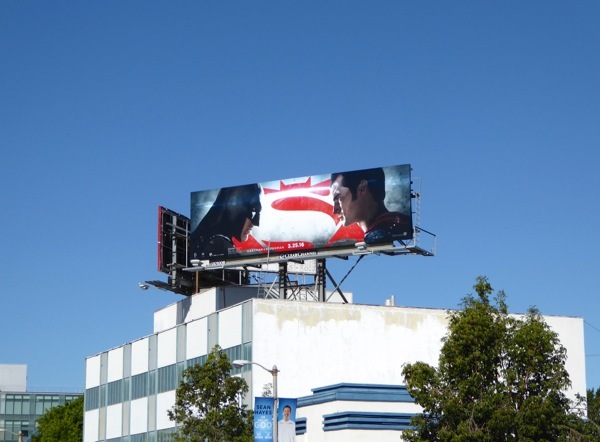 For some, finally seeing two of DC Comics iconic superheroes squaring off in a battle royale on the big screen is a dream come true, so seeing these Batman v Superman: Dawn of Justice billboards filling the city skyline must also be a thrill. 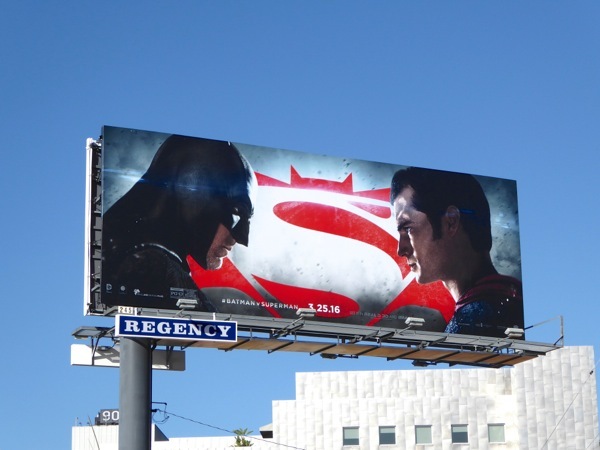 This Spring The Dark Knight and Man of Steel finally meet to hopefully kick start the DC Cinematic Universe, in a war of bat-themed gadgets versus Kryptonian might. 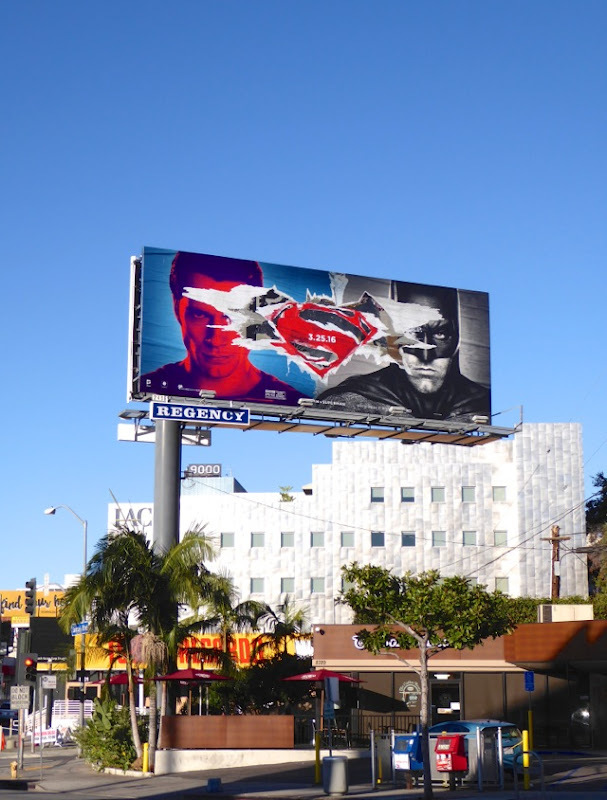 Following the devastation of the city of Metropolis by aliens 'Zod' and Superman (Henry Cavill) in 2013's Man of Steel, Ben Affleck's crime-fighting billionaire 'Bruce Wayne' feels something must be done to protect humanity from this superhuman threat. 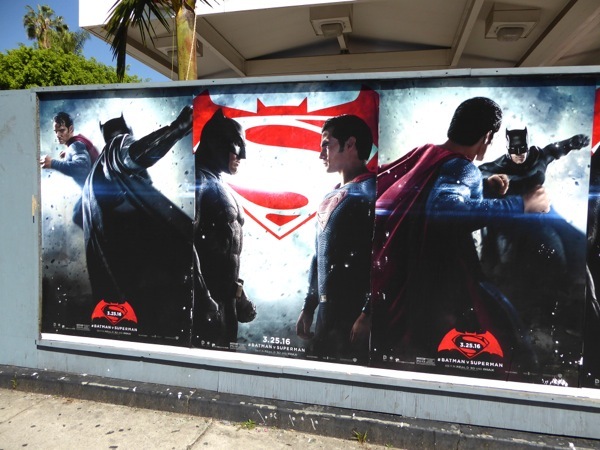 Superheroes battling each other is a comic book trope, and one which fans are eager to see brought to life. 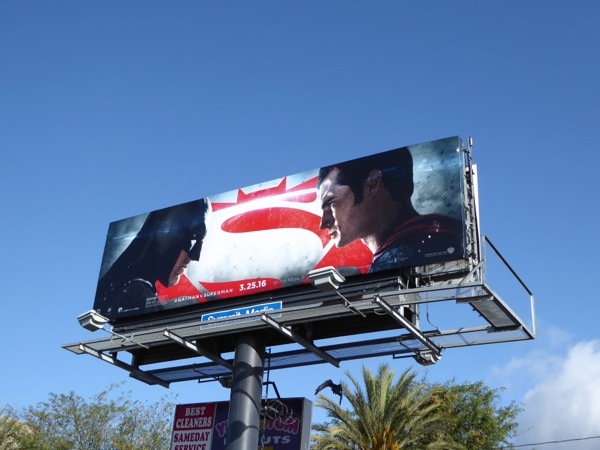 Who exactly would win a fight between the human Caped Crusader and the superhuman who can fly, has incredible strength and shoots laser beams from his eyes? 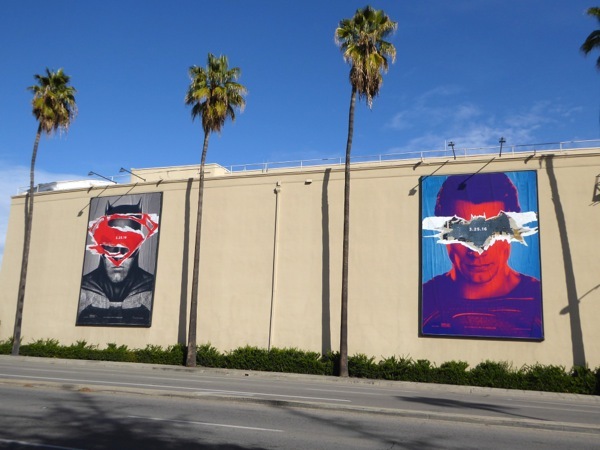 Taking advantage of this animosity between the heroic duo is Jesse Eisenberg's 'Lex Luthor', Superman's arch-foe, whilst an ally comes in form of Gal Gadot's 'Wonder Woman', bringing the Amazonian to cinema screens for the first time and paving the way for the creation of the Justice League super team in the future. 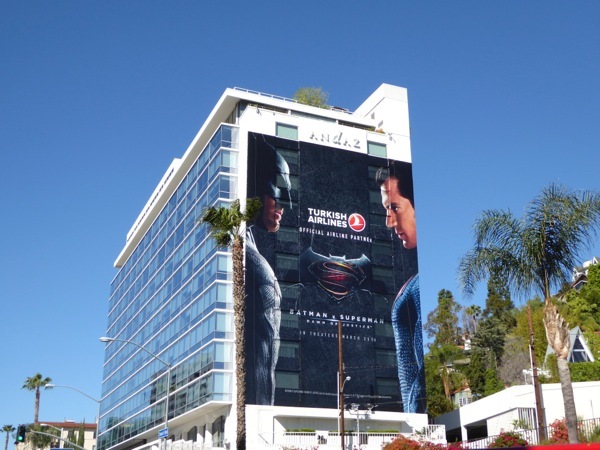 Warner Bros. Studios DC Comics characters are playing catch after Marvel's Avengers assembled several years ago and have enjoyed a steady run of solo hits and even a team-up sequel, but DC has stumbled along the way with misfires like the Green Lantern movie. 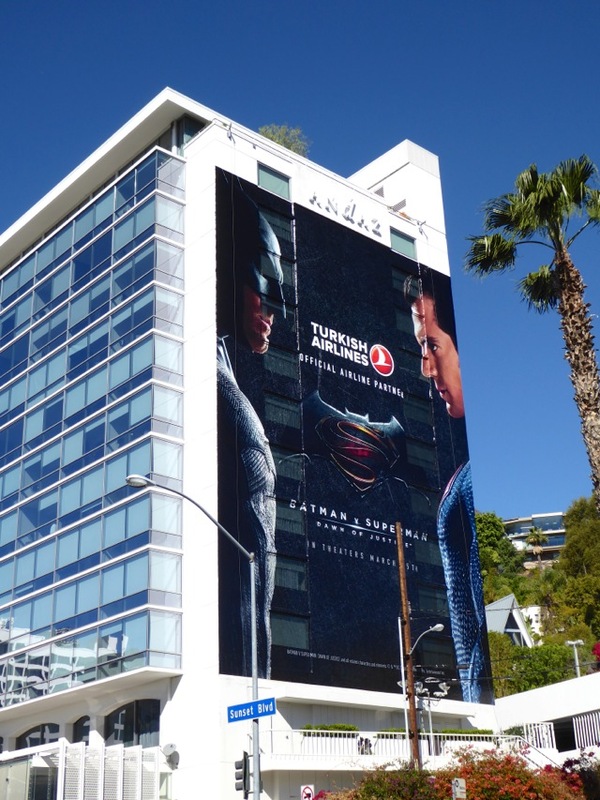 And whereas Gotham City's crime-fighter is suited to dark and broody adventures, many criticised Superman's solo movie reboot for its angst-ridden grimness, wanton property destruction and the questionable choices of the titular caped hero. 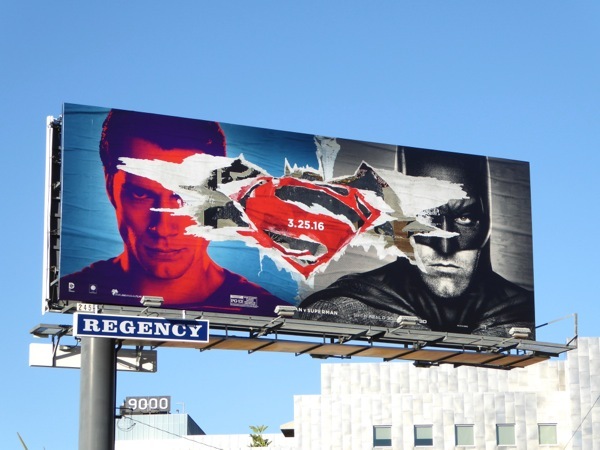 Obviously Warner Bros. Studios and the man at the helm of this dark new universe, Zack Snyder, feels like the way to differentiate DC from Marvel is to go grim and gritty, as this movie ad campaign for the superhero slugfest suggests. 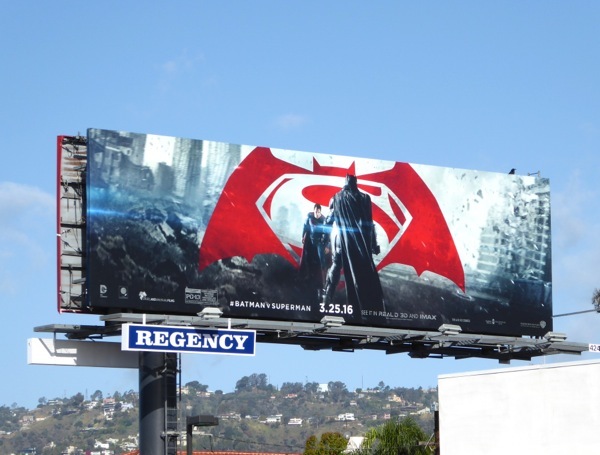 The logo teaser billboards for Batman v Superman were first spied over at Warner Bros. Studios in Burbank, California on January 2, followed by a landscape ad creative in the company's usual billboard location along the Sunset Strip on January 7, 2016. 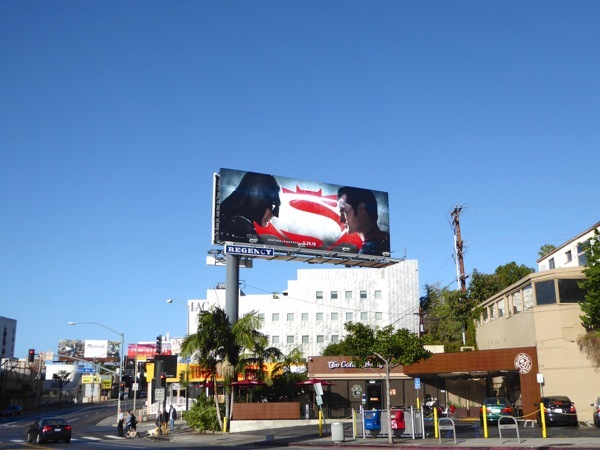 The next wave of ad creatives pitting the conflicted heroes against each other were snapped from March 6 along the likes of Melrose Avenue, Highland Avenue, Sunset Boulevard and Beverly Boulevard. 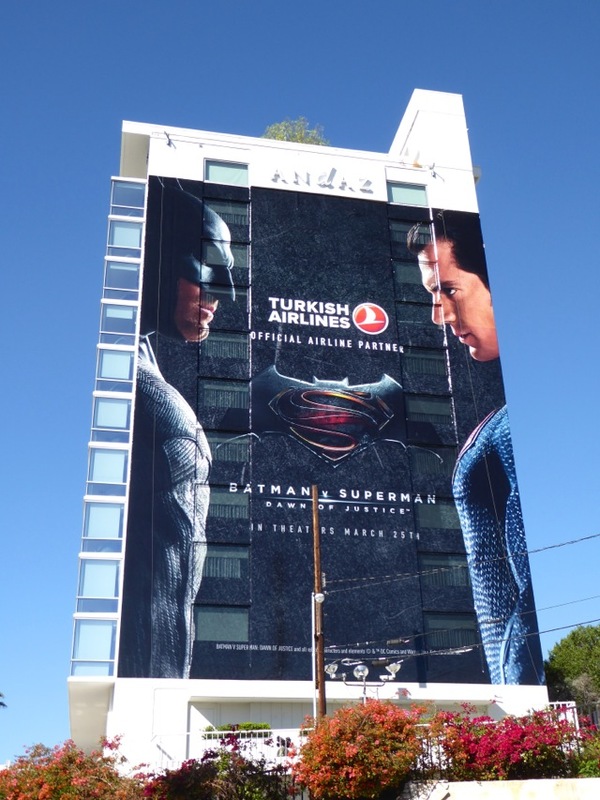 Meanwhile a giant-sized promotional partner billboard for Turkish Airlines was photographed on the side of West Hollywood's Andaz Hotel along the Sunset Strip on March 8, 2016. 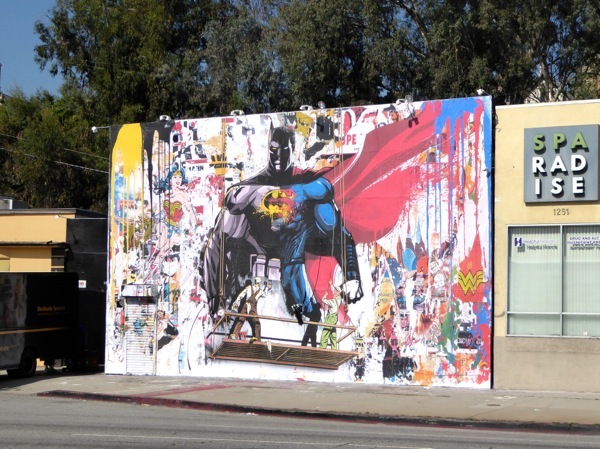 In addition this vibrant mash-up graffiti wall mural for the new movie, which is probably unofficial, was spied along La Brea Avenue on March 17, 2016. 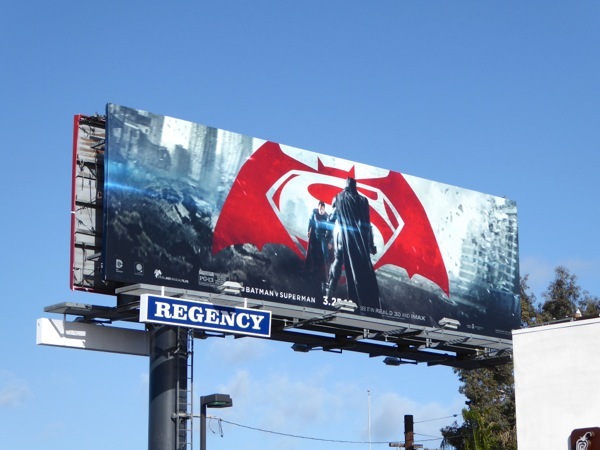 If you're a fan of the comic book characters, be sure to also check out all these video game, movie and TV billboards for Batman and his world, plus these Man of Steel movie billboards lining the city skyline in 2013. 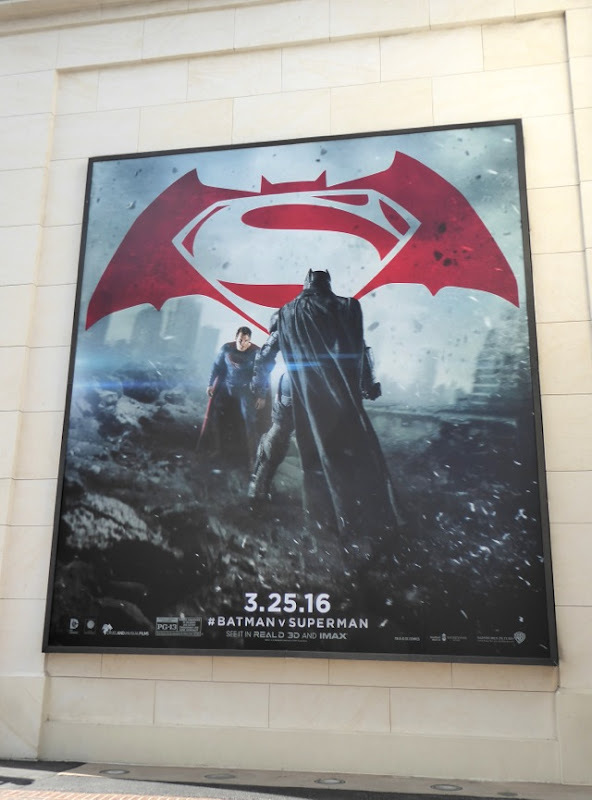 You can also enjoy all these original costumes and props from the Batman movies and these Superman costumes on display. 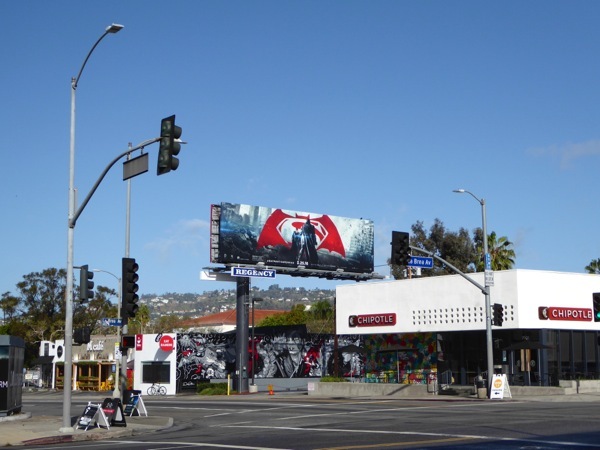 The recent phenomenal success of the Deadpool movie proves that audiences haven't tired of superhero movies yet, especially when they are well done and true to the characters involved. 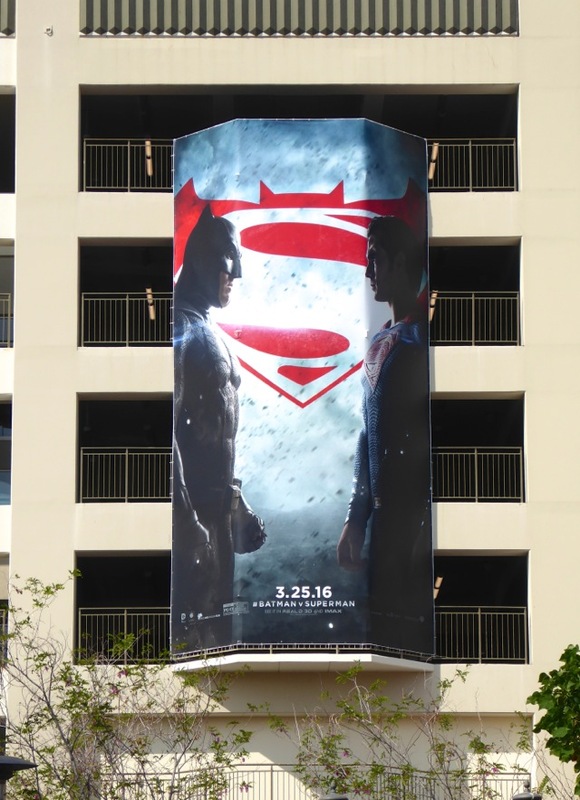 We all know that cinema goers will flock to the box office to witness this clash of comic book titans, but here's hoping this movie is satisfying and doesn't leave a horrible aftertaste after viewing.